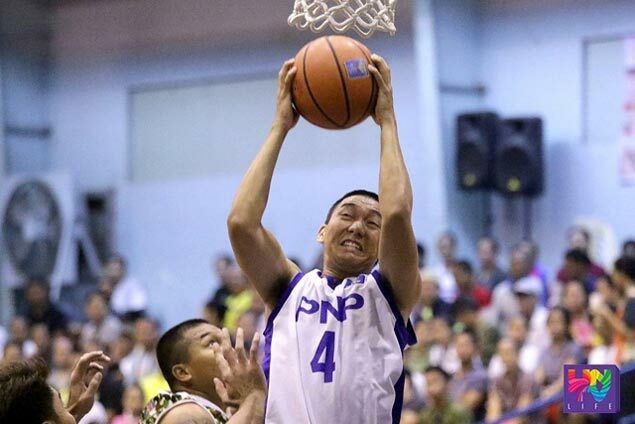 Olan Omiping scores 28 to lead PNP to victory over PDEA. ARMED Forces of the Philippines foiled Malacanang-Philippine Sports Commission’s fightback in the payoff period to eke out a 73-71 win on Tuesday in the 6th UNTV Cup held on Tuesday at the JCSGO gym in Cubao. With Boyet Bautista and Jerry Lumongsod showing the way, the AFP Cavaliers got off to a roaring start but needed huge stops in the endgame to pull of the win, their seventh in eight games. A former star player of Letran, Bautista finished with 20 points on top of four rebounds and an assist while Lumongsod chipped in 17 points. AFP’s gutsy stand in the fourth period negated the double-double effort of Malacanang’s Eric de la Cuestra who tallied 15 points and 13 boards. The loss was Palace’s second in seven games in the tournament organized by UNTV president and CEO Daniel Razon. Reigning titlist Philippine National Police kept its flickering quarterfinals hopes alive with a 95-87 win over the PDEA Drug Busters. Former University of the east player Ollan Omiping exploded for 28 points to lead the PNP Responders to their fourth win in eight games while handing the Drug Busters their sixth defeat in eight outings.